On Saturday afternoon we dragged the boys for a family outing. Really, it was a last chance to have dinner, just the four of us, until April. 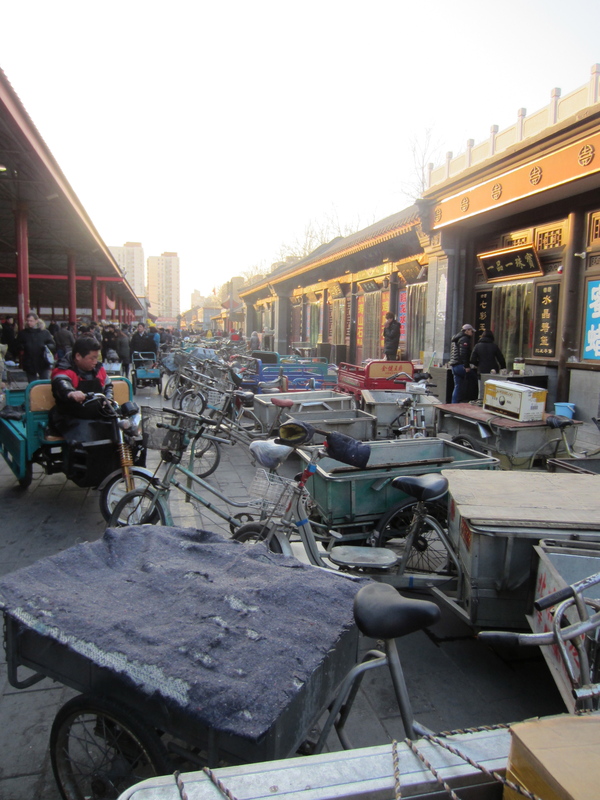 But on the way we stopped at the Panjiayuan market, more familiarly known as the Dirt Market. No one is quite sure why… possibly because it is dirty, although it seemed fairly clean to me. Possibly because it started with treasures displayed on blankets that were just laid on the dirt field. Or, possibly, because stuff is supposed to be dirt-cheap! The market started in the early 90’s and was very much a local affair where people came to sell whatever they had, mostly bits of junk. Occasionally someone found a true treasure and the word got out that real antiques could be found… Ming porcelain, Qing snuff boxes, and lots of Mao era souvenirs. Human nature being what it is, tens of thousands of people now flock here every weekend hoping to find a prize! Or maybe something they don’t really need… we saw Buddha Heads (the boys said I have enough already) Bakelite dial up phones (How did it work? ), giant polished rocks (could look cool in the garden, Mom), bronze braziers, brushes, scrolls, porcelain vases, urns, coins, beads, jewelry. Just about anything you can imagine and most of it rubbish! Buyers must beware… many an expert has been fooled by a very good quality fake. The best selection is available between 6 and 8 am on Saturday morning. By the time we got there around 4 the vendors were starting to pack up. 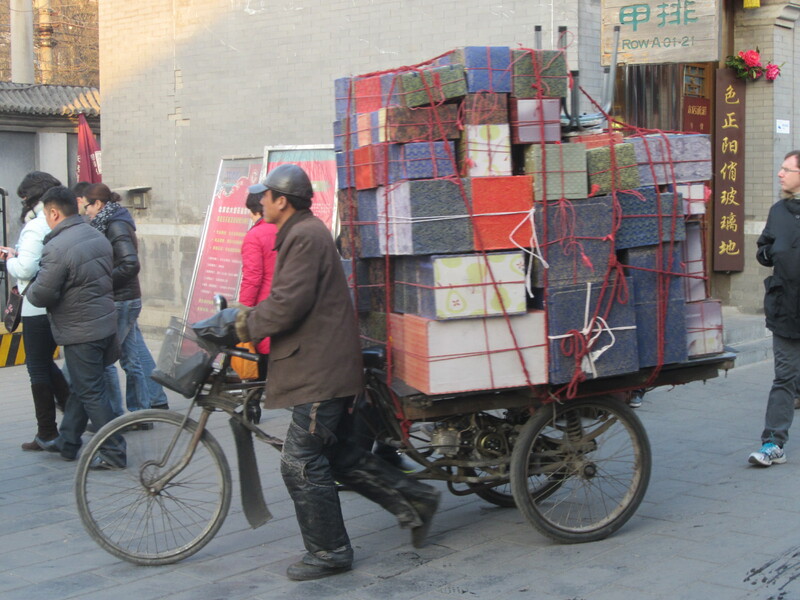 Although this is the best time for bargaining, saves them having to carefully put away one more thing, we decided not to buy, just enjoy the festival atmosphere. I can’t wait to go back, early one morning with out my critics … but will wait until warms up a bit! It is still very cold here! 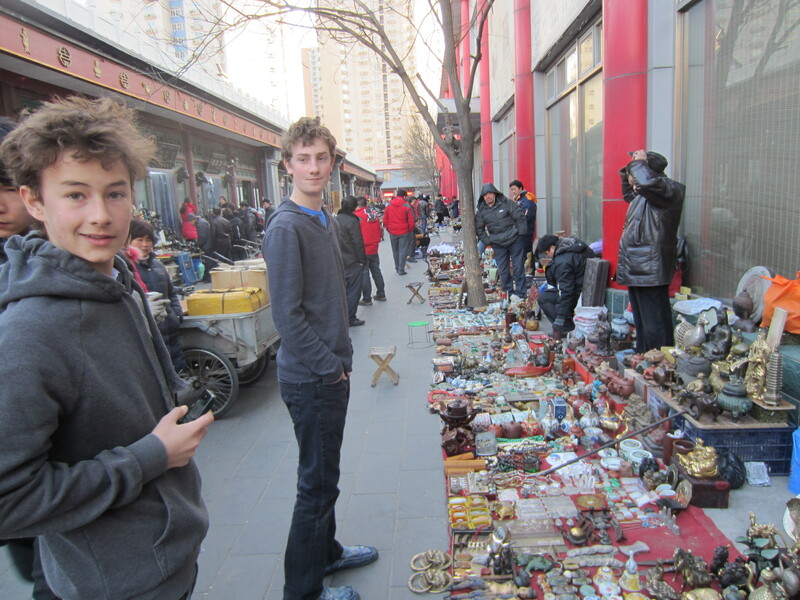 There’s nothing I love more than a flea market (why are they called that?) or a garage sale. I would have loved this outing and I probably would have bought something, knowing me. I’m hoping to visit China in October. Do you think you’ll still be there? I know about your Spring Break visitors – there’s quite a crew coming your way!